This seems odd to many, and they insist on making the problem more difficult than it needs to be. But the reason is simple. Trajectory, the bullet's flight path, depends on the horizontal (level) range to the plane of the target, not the line of sight range up or down hill. Your eye sees the line of sight (slant) range from your position to the target, which is longer than the horizontal range. Remember that it is gravity working on the bullet during its flight time that causes it to drop. If you were to shoot straight down, say from a tethered balloon, the bullet would have no curved trajectory, it would travel toward the earth in a straight line, just as if you simply dropped it. Likewise, if you shoot straight up, the bullet travels up in a straight line until its momentum is expended. Again, there is no curved trajectory. You can infer from this that the farther from the level position a rifle is held when a bullet is fired, the less the bullet's drop will be over any given line of sight distance, whether it is fired up or down. Since your sights are set to compensate for bullet drop, and there is less bullet drop when shooting at an up or down angle, you must hold lower than normal to maintain the desired point of impact. For example, if you are shooting up or down at a 40 degree angle and the line of sight range is 400 yards to the target, the horizontal range is only 335 yards. 335 yards is the distance for which you must hold. Leupold RX-III TBR display for example above. Illustration courtesy of Leupold & Stevens,Inc. The Leupold RX-III rangefinder that I reviewed for Guns and Shooting Online includes among its many features a mode that automatically compensates for up and down angle shots. 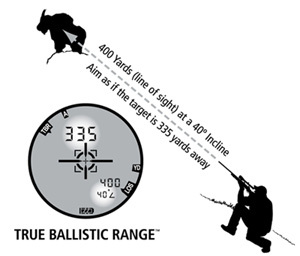 Leupold calls this "true ballistic range" and you can set the RX-III's main readout to display the horizontal distance to the target, which is the distance you need to worry about in terms of trajectory. In the lower left corner of the display it also tells you the angle at which your are ranging and the line of sight range from your position to the target. For example, if I range the top of a tall fir tree some distance from my house the line of sight range is 151 yards and the angle is 19 degrees of elevation, while the horizontal range--the true ballistic range--is only 130 yards. It is a neat rangefinder and a little time spent with one drives home the reality that, in terms of bullet trajectory, it is the horizontal, not the line of sight, range that matters. Copyright 2006 by chuckhawks.com. All rights reserved.